I spent another beautiful Friday evening up at Deer Valley with the Utah Symphony. Seriously, if you haven’t experienced a show there, get up there before the summer ends! The air is so cool, and the skies and mountains are beautiful. It’s an amazing setting for a concert. For this performance, the symphony helped the audience battled it out over the 70’s and 80’s. Two decades of great music. 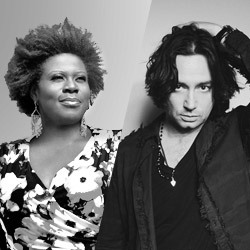 The featured guests for this performance were vocalists, Capathia Jenkins and American Idol finalist and Tony Award Nominee Constantine Maroulis. The concert opened with the Utah Symphony performing “A Fifth of Beethoven”, which is a disco version of Beethoven’s 5th Symphony featured on the Saturday Night Fever soundtrack. This was a really fun way to start off the 70’s portion of the evening. Following the opening piece, Constantine took the stage and sang “Nights on Broadway” from the Bee Gees. We were in the thick of the 70’s with this song. We jumped from there to Chicago’s “25 or 6 to 4”. This is a song that Constantine has performed with the band Chicago. I thought he did a great job with this one. It’s a really good song, and it seemed to fit his vocal range perfectly. Constantine then sang “Heaven on Their Minds” from the rock opera Jesus Christ Superstar. I thought he sounded great, and this is one of the best songs from that musical, but it seemed like a strange fit for this concert. Yes, it was from the 70’s, but I think the crowd was a little surprised to be hearing a song from a musical. It was a great performance, but maybe just not a great fit for this concert. Maroulis finished his set with the Utah Symphony by singing Queen’s “Bohemian Rhapsody”. This song went over great with the crowd. Especially the operatic break in the middle of the song. The crowd was singing out “He’s just a poor boy from a poor family!” and “Let me go!” at the top of their voices! Constantine moved into the audience to sing the rocking conclusion of the song. He seemed like he didn’t want to leave the stage, but it was time for Capathia Jenkins to sing her 70’s songs. Maroulis was given a loud ovation as he exited the stage. Capathia has a beautiful voice. This was displayed immediately with her opening song “You’re the Best Thing” from The Style Council. This was another strange song selection. There are so many songs from the 70’s that I think a little of the performance was lost to the crowd not being too familiar with this song. I think people had different expectations in mind for this show. Judging by the way many were dressed up, I think they thought they’d be hearing some songs they were more familiar with. That being said, the songs they did hear, and the performances they witnessed were most certainly admired. Capathia the followed up with Gloria Gaynor’s anthem, “I Will Survive”. I think this was the type of song that the audience had in mind. Which was indicated by how quickly people rose to their feet when this song began. Capathia’s voice fits this song just right. She seemed to be enjoying herself, and the audience was having a blast. The intermission came quickly. I was surprised that it was already time to take a break. The great thing about the intermissions at Deer Valley is it gives me time to get a sense of what the audience thinks of the show. And while the general consensus was that the song selection was a little different than expected, the talent and performances were excellent. The second half of the show began with the Utah Symphony performing a medley from the 80’s album “Hooked on Classics”, which was a compilation album filled with great pieces of classical music arranged in an 80’s style. Just like “A 5th of Beethoven” escorted us to the 70’s, this was an excellent gateway into the 80’s. Conductor, Edwin Outwater shared with the audience that there had been a contest to give someone the opportunity to sing the lead vocals on the theme song to “Ghostbusters”. He mentioned that pretty much no one entered so he was left to find a vocalist. He had a friend from San Francisco who flew out to attend the performance, and on the way to Snow Park Outdoor Amphitheater, Edwin asked him if he wanted to sing the song. I forget his first name, but I know he was referred to as Dr. Chang so that’s what we’ll call him. He’s a surgeon in the bay area. Dr. Chang walked up on stage with a lyric sheet in hand, and the Utah Symphony started the song. I know this situation just came together last minute, but it totally added to the excitement of the song. There was curiosity as to how Dr. Chang would sound, if there would be mess-ups, or if it would all come together somehow. Well, the latter is what happened. There were a couple lyric flubs or coming in too early, but overall it was great. Dr. Chang sang the song well, and the audience cheered him on throughout the song. And of course, we all sang out “Ghostbusters!” when Dr. Chang held his microphone out to us. Constantine Maroulis returned to the stage and sang a “Roxanne”, by the Police followed by “Bring Him Home” from the musical Les Miserables. This was another time where song selection seemed odd, but I have to say that Constantine performed “Bring Him Home” beautifully. I would have never thought of him to play the role of Jean Valjean in “Les Miserables”, but after hearing him sing this song, I can see it. He finished his set with Guns n Roses’ “Sweet Child of Mine”. It’s not every day that you’re going to hear “Bring Him Home” and “Sweet Child of Mine” performed back to back in a concert. Especially by the same vocalist! It was a real pleasure to see Constantine perform. Capathia Jenkins returned to the stage to sing “What’s Love Got to Do With It” by Tina Turner, and “I’m so Excited” by The Pointer Sisters. Much of the audience was on their feet and dancing. I hadn’t heard of Capathia before this concert, but she is a real talent. Which was on display when she sang “And I am Telling You” from the musical Dreamgirls. I know I’m beating a dead horse, but I don’t know that anyone expected broadway songs to be a part of the evening’s song list, but it’s impossible to deny that the performances were great. And this number was no exception. This song won Jennifer Hudson an Academy Award for this role/song, and Jennifer Holiday a Tony Award for originating the role. Capathia’s performance earned her a standing ovation. She was fantastic. The concert ended with Capathia and Constantine singing Journey’s hit song “Don’t Stop Believin’”. The audience was on their feet and in full voice for this one. Constantine sang this song when he was in the Broadway musical “Rock of Ages” so it was cool to see him perform the song again. I thought conductor Edwin Outwater was one of the major highlights of the concert. He spoke to the audience often, introducing songs and conducting crowd poles on which thing was better in the 70’s or 80’s. Poles like, 8 tracks, Cassette Tapes, Cd’s or Vinyl (Vinyl won). Or 70’s Chicago vs 80’s Chicago (80’s Chicago won). Or Pet Rock vs Cabbage Patch Kids (Cabbage Patch won). He was really funny and engaging with the audience. The conductor doesn’t usually speak often, so I thought it was a fun addition to the show. I’m a huge fan of the Utah Symphony. They’re versatile, talented, and always prepared. If you get the chance, whether up at Deer Valley, or Abravanel Hall or anywhere else they perform, go see them. You will not be disappointed.